If you think the quickest way to a queen’s heart is through her 17 pet bunny rabbits then have I got the movie for you. The Favourite may seem like a stuffy period piece on its opulent surface — even its title screams “I’m an Oscar movie!” — but this is one cheeky and wickedly entertaining romp. The backdrop just happens to be the British palace circa the early 18thcentury. The film also features three divine performances courtesy of Olivia Colman, Rachel Weisz and Emma Stone. Each strong-willed character warrants her own plot thread; I’ll start with Stone just because she’s the most unlikely of the three to wear a corset. She’s Abigail Masham, a lady turned servant turned influencer in the court of Queen Anne (Colman). Agigail turns up at the palace down on her luck and looking for a job. 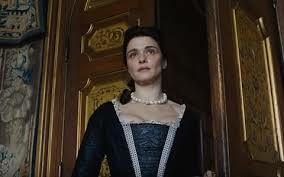 Her cousin Sarah Churchill (Weisz), the married Duchess of Marlborough, give her a thankless one. For a former lady, scrubbing the floors in the basement will not do. Anne is a little batty and bossy, not necessarily in that order. Her country is at war with France, yet the duchess is the one that does all the negotiating. Sarah, in fact, is not only the queen’s most trusted ally, she is her secret lover. Abigail is the one who catches them k-i-s-s-i-n-g. With the knowledge in hand, she plots her power move. First she gets closer to Sarah . . . thereby getting closer to the queen herself. Why yes, Abigail would be happy to rub soothing lotion on her majesty’s leg burns and pour her a cup of hot chocolate and jump into bed with her. Eventually, the queen doesn’t want Sarah anymore because she has Abigail to keep her warm at night and tend to her every need. It’s a delicious love triangle, except not all sides are equal. These decidedly offbeat shenanigans are the work of a Greek director named Yargos Lanthimos. This is his third English-language film after The Lobster and The Killing of a Sacred Deer, which means he has a knack for the cold, the cruel, the brutally absurd. He makes the regal palace seem both claustrophobic yet expansive (though why the constant use of the fish-eye lens? Very distracting!) With each turn of the knife, he employs a bewitching classical music score. I expect his movie to be lavished with both praise and Oscar nominations for costumes, backup, art direction and music. He also cast his film beautifully. Colman is a royal hoot as a woman who’s pathetic, spoiled, short-fused, desperate and quite intimidating. This is a physical performance as well; I’m not sure Colman ever stands upright and prances around like royalty — she’s usually hobbled or draped in bed. Weisz shoots off her gun just as skillfully as she shoots off her mouth. She’s calculating to be sure, and yet truly cares for the queen. Stone is all verve and equally as formidable as her costars, though I did notice that she occasionally lapses into an American accent. After its world premiere at the Telluride Film Festival, a friend said to me, “Who is going to see this movie? !” True, a period piece, no matter how arch, won’t pack ‘em in at the Cineplex. This is not Ralph Breaks the Internet or a provocative take on today’s socio-political issues. What The Favourite does have in its favor — er, favour — is the fact that it’s a pleasure to watch. This power trio are catty and manipulative because they can be! They never apologize for their sexuality, as well they shouldn’t. Long may they reign. 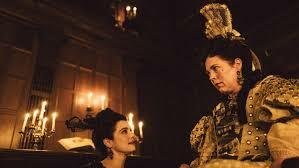 The Favourite, which premiered at the Telluride Film Festival and was the opening night selection of the New York Film Festival, opens in theaters on Friday, November 23.